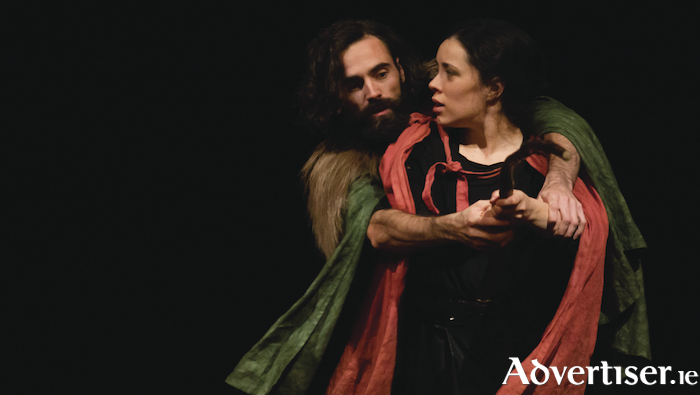 Seán T Ó Meallaigh and Kate Finegan as Diarmuid and Gráinne in Tóraíocht. FÍBÍN, THE Galway based Irish language theatre company is celebrating its 15th anniversary with its largest production to date, a nationwide tour, in April, of Tóraíocht, directed by Mikel Murfi. Tóraíocht, Philip Doherty's new version of 'The Pursuit of Diarmuid and Gráinne' from the epic Fenian Cycle of Irish mythology, will be staged in the Town Hall Theatre on Monday April 9 at 8pm and Tuesday 10 at 1pm (special matinée schools performance ) and 8pm, before heading to Cork, Dublin, and Carlow. The play is suitable for ages 12 upwards. Tóraíocht is a love story full of outlandish feats, monsters, comedy, masks, and an aerial routine, as Diarmuid and Gráinne must stay one step ahead of Fionn and the Fianna! All performances will be subtitled in English. The cast is Gráinne Bleasdale, Méabh Ní Chualáin, Kate Finegan, Liz Fitzgibbon, Fionnuala Gygax, and Seán T Ó Meallaigh. The creative team includes award-winning set designer Sabine Dargent.